Hazel has been asking to fly a kite for awhile. Somehow whenever we are at my parents, it does not happen. They live near a beach and usually have more wind (and less trees and power lines) than us. Plus my father has some kites or at least he thinks he does. Well I bought her a cheap Disney Princesses kite and we are taking it to my parents' house this weekend. She is so excited. I told her by having her making paper kites in Asian styles with me first. 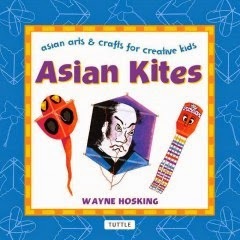 I was really excited to find Asian Kites by Wayne Hosking at our local library. All of the styles of kites we made came from this book. The book explains how to make real kites with Silkspan, however I was not looking to make kites to fly, but kites to show Hazel different styles from the Asian countries. We made them with paper and streamers. 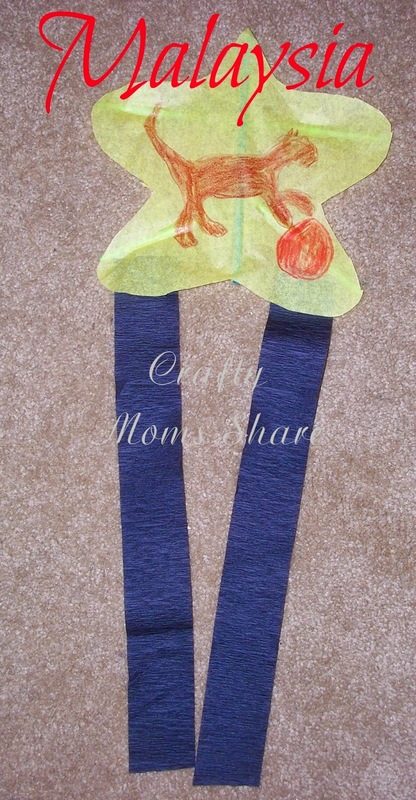 In fact we used leftover black streamers from Oriental Trading that we reviewed in our Minnie Mouse Pinata post. We also substituted drinking straws for the balsa wood to strengthen the kites. The book has a bit of the history of the kite in the Introduction. Although many places say the first kite was flown in China, Asian Kites says it is actually unknown. It is believed that kites date back to two and a half to three thousand years ago. Kites also once carried messages based on their shapes, pictures or other cultural symbols. Eventually every day people began to fly them without a religious significance. There are many theories to how a kite came to be including leaves, trying to emulate birds, the wind blowing a farmer's hat and a tent or sail becoming airborne in the wind. Stories of Chinese kite flying spread through Europe thanks to Marco Polo. In the 15th and 16th centuries examples of kites were brought back from China and the East Indies. In the 18th and 19th centuries Europeans and Americans were using kites for scientific studies of natural elements including developing the flying machine. Asians were still flying kites to celebrate nature and human spirit. Many Asian cultures share their past with kite festivals as well as kite tours. China gets to boast the first written record of a kite flying dating back to 196 B.C.E. The description tells how the Chinese general Han Hsin flew a kite to help calculate the distance his army would have to tunnel to escape. There are many legends of how the Chinese attempted to use kites in battle. The Chinese also used them for cultural and religious significances. With the invention of paper by Tsai Lun, kites became a universal folk art and possible for all people to enjoy flying. From a Kite Day Festival to scaring away evil spirits at grave sites, the Chinese have a rich history of kite flying. Today China has six main kite regions. Each region uses a unique kite style. October is the traditional month for kite flying, but due to favorable winds kite flying season usually runs from the Chinese New Year through Qingming, the day for mourning the dead on April 5. We chose to make the Butterfly kite. The book describes it as a fair to good flier in light to gentle breezes. 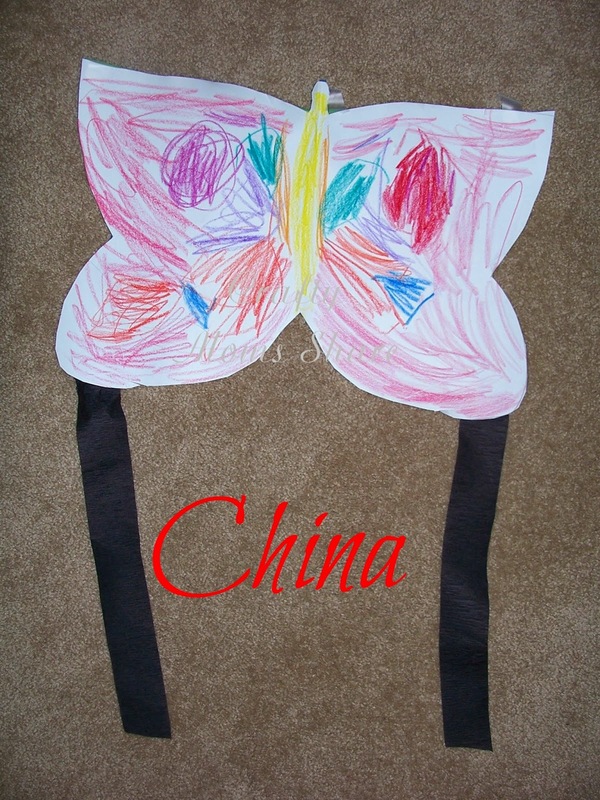 The Chinese often make and fly Butterfly kites because they represent beauty and a free spirit. There is also an old saying: "Only the greatest artists go to heaven to paint butterfly wings. Kites have a long history in Malaysia as well. In fact some scholars believe Malaysia may have been the birthplace of kites. In Malaysia kites are called wau. A legend from the state of Kedah say the knowledge of how to build a kite is an effort to appease the heavens. If you visit northern Malaysia any time from April to June you will most likely see colorful kites flying. During this time they have monsoon winds which are strong enough to fly large kites and also it is after the rice harvest and is a time when farmers and fishermen celebrate life. We chose to make the Mini Wau. The Mini Wau is a child's kite that is often flown from a stick. Since they believe the wau is a gift from the gods, they fly them in hopes of good fortune. This one I made out of tissue paper which the book said could be used instead of lightweight Silkspan. Kite flying is very popular in Thailand as well. Oral tradition puts kite flying back in the 13th century when Thailand became a country. The earliest recording of kite flying was a ritual priests performed. They were also part of fighting war as well as just a love of the entire country. Kites often were entangled with the roofs of the royal palace. Eventually there was an edict forbidding flying kites over the palace. Based on a challenge of King Rammi II, a traditional kite game is established and is now a national sport held each March in front of the royal palace. 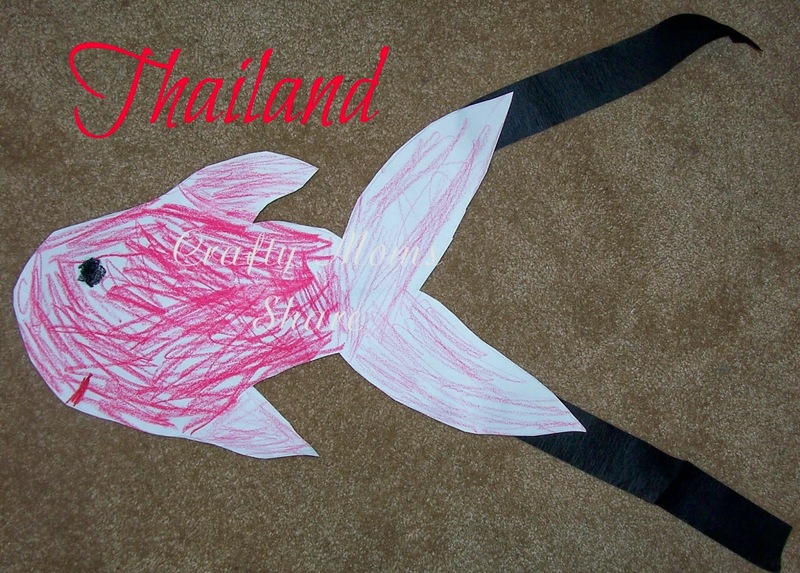 We chose to make the Thai Fish kite. It is said to be a fair to good flier in gentle to moderate breezes. The fish is a major source of food in Thailand. It is second only to rice and since both are associated with water they are said to belong together. The fish often represents abundance. Korea may have gotten kites from China during the period of the Three Kingdoms. Kites are called Yeon in Korea. 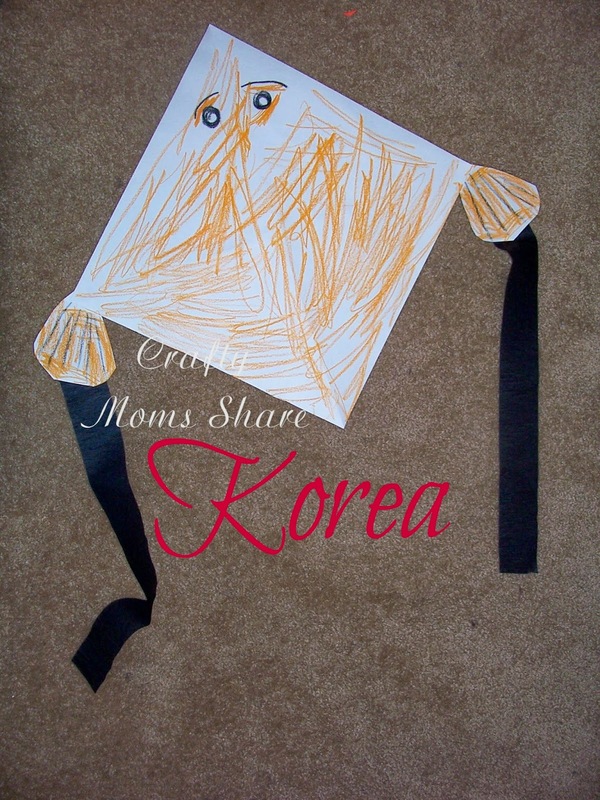 Kites have not changed much in Korea over the centuries. Kite flying is part of many ceremonies and once again there are many stories of how kites were used. The kite flying season closely relates to the agricultural cycle. Koreans begin flying kites on the first day of the lunar calendar and the kite season lasts for fifteen days. There is also an annual custom of kite fighting. Kite fighting involves trying to cut the other kites' strings. They do not attach blades of any kind, but use skill of the flier and the specially prepared string to do this. Once cut, the freed kite belong to whomever can capture it. They have special kites for kite fighting called a bangpae-yeon or shield kite. There are also special kites to fly on the fifteenth day of the lunar calendar to fight off evil. 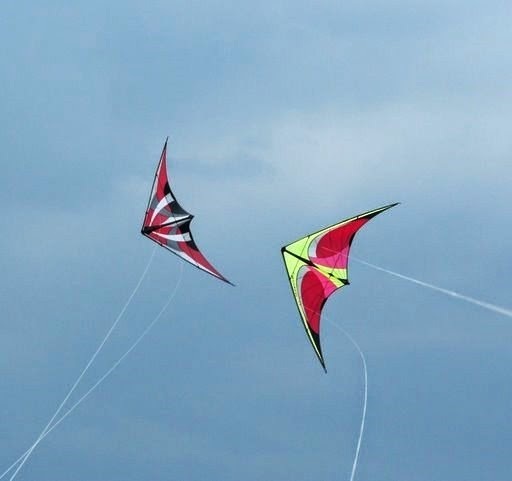 Traditionally the flier of these kites releases the line after all of the line is out. These special kites include the aeg-mag-i-yon and song-aeg-yon. We chose to make the Ga-o-ri-yon or ray fish kite. It is fair to good flier in light to gentle breezes. It is a rhombus shape and resembles a sting ray in the sky. It is typical of children's kites all over Asia. During the seventh century Japanese civil servants brought the knowledge of kites and paper from China. Kites held a special importance in Japan and only the privileged class and monks could fly them. The monks used them to keep evil spirits away and invoke a rich harvest. The Japanese considered kites a way to carry petitions to the spirit gods. It is also a traditional Japanese belief that a destroyed kite's soul is released and is free to be reborn in another kite. There are many Japanese folk stories involving kites. There are approximately 340 different traditional kites made in forty-two districts of Japan. Families share their heritage today through kites on special days like New Year's Day and Children's Day. There are also kite battles in May and June. We decided to make a kao-no-tako or octopus kite. It is a fair to good flier in gentle to moderate breezes. It comes from Sanjo in Niigato (Japan's west coast). Tako means both octopus and kite. During the Edo Period, kite makers often hung these octopus-shaped kites in front of their stores as a sign of their occupation. 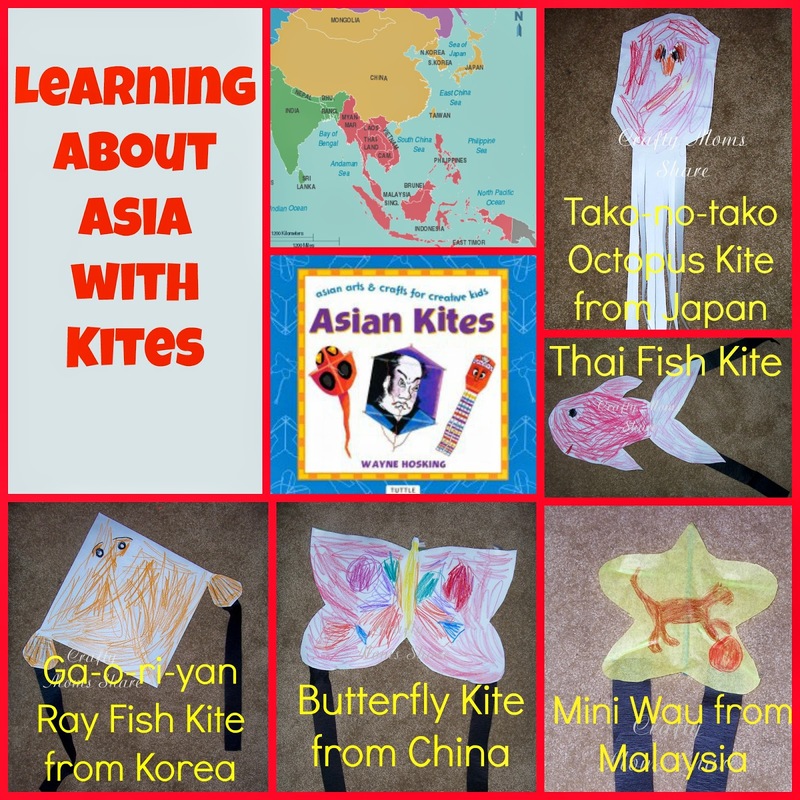 Those are our Asian kites and some of the things we discovered about kites in Asia thanks to Asian Kites. 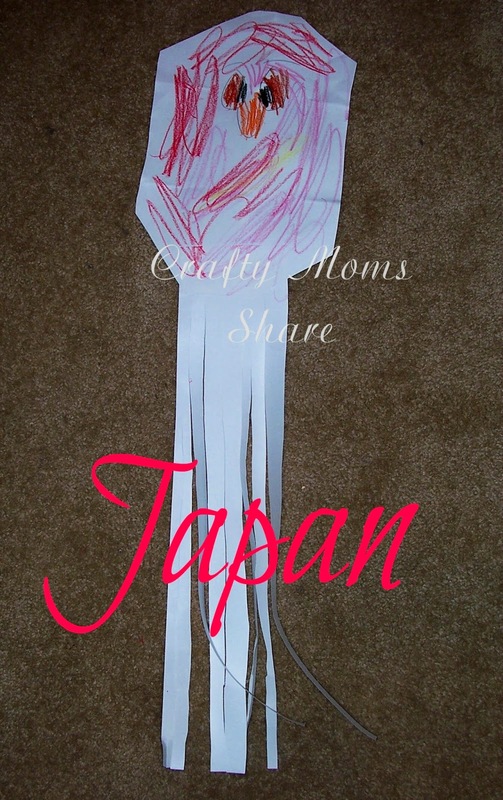 Over the weekend I hope to share what we have learned about Children's Day in Japan as well as our craft of a carp wind sock (often mistaken for a kite). 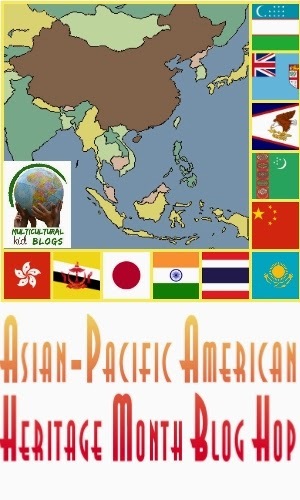 We are sharing this at the Multicultural Kids Blog Asian-Pacific American Heritage Month Blog Hop. If you missed our post co-hosting this blog hop, we shared some Asian-Pacific Island crafts and stories we have done and read to learn more about the cultures in that part of the world.